Let’s be honest – eating a healthy diet and cooking healthy meals for your family takes time and energy. And when you’re a busy wife and mom, you tend to run out of time and energy very quickly. That’s how you end up serving take-out or fast food for dinner, when you really wanted to serve a healthy, delicious meal. 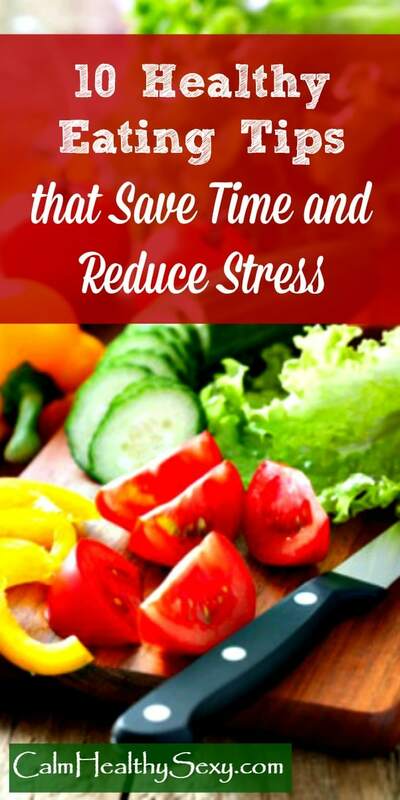 To avoid the stress and frustration you feel when you want to serve healthy food but need to get a meal on the table quickly and easily, you need some healthy eating tips and strategies that actually work for busy wives and moms. And because I love collecting and trying out healthy cooking tips, tricks and hacks, I’ve got some good ones to share with you! Here are 10 of my favorite time-saving and stress-reducing tips for cooking and serving healthy meals. These strategies are easy to learn, and you can adapt to your schedule. They take just a few minutes on the front end, but save you loads of time and energy on busy day. • Make a menu that fits your family’s schedule for the coming week. This task is critical; I’d go so far as to say that you won’t be able to cook and serve healthy food if you don’t have a menu and a plan. Your menu can literally “make or break” your family’s healthy eating for the week, so be sure to create one that actually works for you. And it only takes about 10 minutes. • Clean out and organize your refrigerator, freezer and pantry/cupboards. You need to know what you have on hand and be able to grab it quickly when you need it. It’s much easier to cook healthy meals if you can see what’s in your refrigerator, freezer and pantry. So organize those areas, and do a quick clean-out and reorganization whenever they get messy. This doesn’t need to be a deep cleaning – just devote 10-15 minutes to organizing each area. • Make a master meal list. This idea comes from Christina, author of Juggling Real Food and Real Life , and it’s a great one. Make a list of all of your “tried and true” recipes and refer to it when making your weekly menu, or when your meal plan falls apart and you have to come up with a new plan quickly. Check out Christina’s article on meal planning and the master meal list. 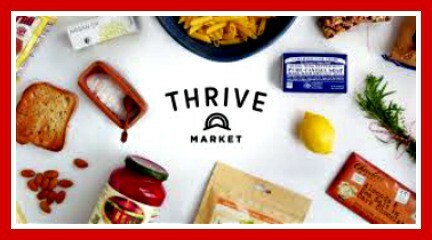 • Make a list of healthy food items you want to have on hand and start stocking up. A pantry stocked with whole grain pasta, brown rice, canned diced tomatoes, canned beans, natural peanut butter and other healthy staples can keep you out of the drive-thru line! Healthy staples provide lots of options for quick lunches and dinners when your day doesn’t go as planned. So start making a list and purchase a few items on the list each time you go grocery shopping. • Double or triple almost everything you do. Don’t cut up onions and peppers for chili tonight, and then cut them up again for tacos tomorrow night. It takes too much time! The same with grating cheese and similar tasks. Cut up or prep double or triple of things you use regularly; that way you’ll have some for later in the week and, even better, some for the freezer. And make a double or triple batch of anything that freezes well. 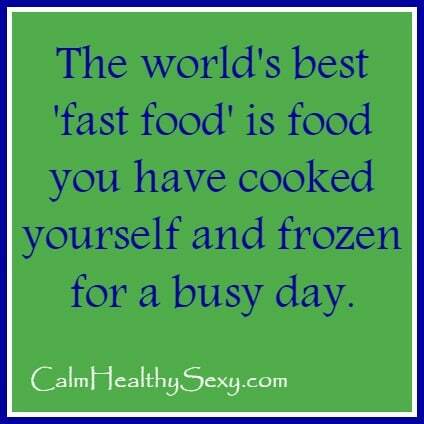 The world’s best “fast food” is food you have cooked yourself and frozen for a busy day. • Cook London broil in the Crockpot to make shredded beef. Cook a lot of it, preferably enough to serve your family two meals plus some for the freezer. Add some water or beef broth and cook on low all day. Shred the beef and add picante sauce for tacos or burritos, barbecue sauce for barbecue sandwiches, or any vegetables or seasonings you like for shredded beef and rice. Use the extra for lunches or a second dinner, and freeze the extra for a busy day. • Wash, peel, and cut fruits and vegetables for the week. This tasks takes a bit of time (but maybe only 30 minutes), but saves a ton of time and stress on busy weeknights. You might skip making a salad at 7:00 pm on a Tuesday night if you have to start from scratch, but if everything is cut up and ready to go, it takes less than a minute to make . The same is true with fruits that can be popped into lunchboxes on a busy morning or served as snacks on the way to soccer practice. • Boil some eggs. Serve them as part of a quick breakfast, add them to salads, or use them to make egg salad. The Egg Safety Center (eggsafety.org) says that hard cooked eggs spoil faster than raw eggs, so keep them refrigerated and use them within a few days. My friend Jaime serves boiled eggs and fresh fruit for a quick breakfast, and her young children love it. • Pack snacks for the week so they’re ready to “grab and go.” On Sunday afternoon or evening, fill sandwich bags or small containers with popcorn, whole grain crackers, cheese, grapes, granola, healthy muffins and other items so that family members can grab them easily for lunches or quick snacks. One more thing – In thinking about which of these healthy eating tips might work for you, keep in mind that changing to a healthier diet is a process. Every bit of progress is a step in the right direction and should be celebrated. So focus on the things you have accomplished, rather than the things you haven’t yet managed to change. Try incorporating one or two of these ideas into your schedule this week. Next week, add another one. 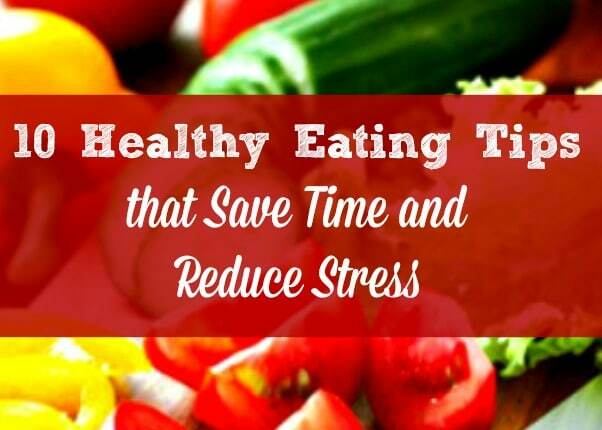 Over time, you’ll create a healthy eating plan for your family, with very little stress or hassle. 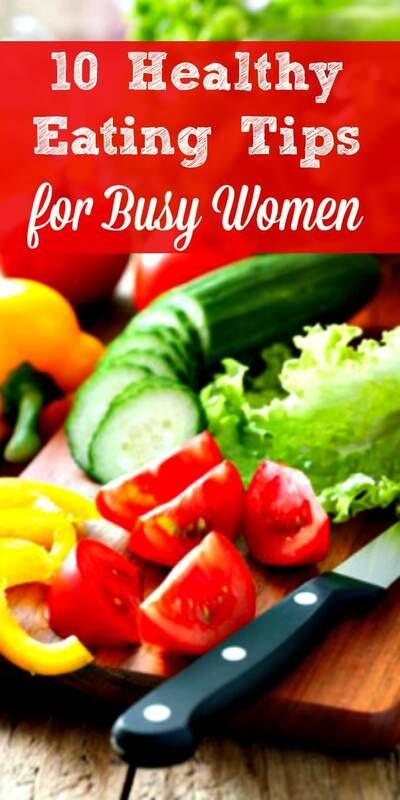 For more healthy kitchen strategies plus 24 quick and healthy meals, download my free ebook, The Busy Woman’s Guide to Healthy Family Meals. This is the best meal plan article I have read in a long time. It’s not cluttered up with useless details. It is clear and to the point with some very practical ideas as a bonus. Good job! Thank you! 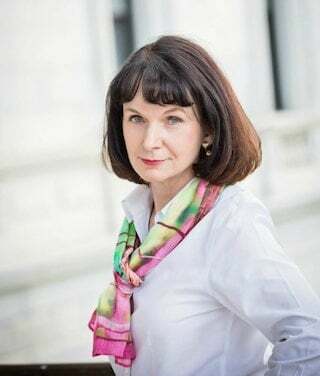 Thanks so much, Diane. I really appreciate it! I hope you have a wonderful weekend filled with fun family and friends – enjoy! Thank you, my friend. You too! Love this Gaye. So many strategies that most everyone can do once they get the hang of it. Great post! Great tips! I love these. Some of them I already do and some I could do better on! I admit I have a big advantage working from home because I can monitor what is cooking for a minute or two here and there, but I know with a crock pot anyone can do better if they put it to use.